This ignition system was originally developed by Statoil and their partners for use in conjunction with flare gas recovery systems on offshore facilities in the North Sea. The flare, being normally unlit, needs to be fitted with an extremely reliable ignition system that ensures instant flare ignition on demand. The system works by using compressed air to drive a small ignition pellet along a guide tube up to the flare. The pellet explodes on exiting the guide pipe generating a shower of sparks over the flare tip(s) which instantly ignites the gas. 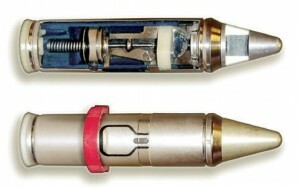 The spent cartridge is retained in a fragment collector that is mounted on the flare deck. 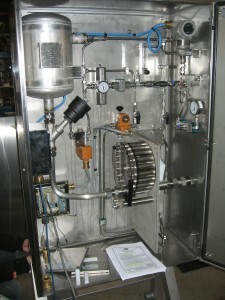 The system is designed with a guide pipe range of up to 2000 meters from the launching unit. The pellets are safe to handle and are stored in a magazine in the launching unit which is located on the platform or at grade. The guide tube is purged with air to keep it dry and is supplied in stainless steel, as such it does not need to be gas tight. The routing of the guide pipe must be such that no tight radius bends are present. The main disadvantage is the high capital cost and the reliance on a flare monitoring system if an auto re-ignition sequence is required. Damage to the guide tube can result in the pellets becoming stuck. It should also be noted that because the pellets are classified as dangerous goods (due the small incendiary charge) they are subject to specialist cargo handling.